Cut the onion and peel its flaps. Take 1 tbsp of veg. oil in a vessel and fry onions and capsicum till it becomes bit soft. 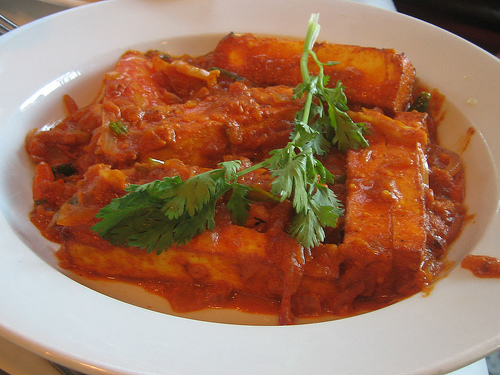 Fry paneer cubes in the same oil till it becomes light brown in colour. Now add all the sauces, vinegar, and tomato in a grinder and mix thoroughly. Add this mixture of sauces into fried onion, capsicum, paneer, salt, pepper, ajinomoto and stir fry in the hot utensil on flame. Now add corn flour in cold water and add to the above prepared mixture to thicken the gravy. Quickly incorporate and remove from heat.